So! New cellphone, with much spiffier camera: 13 megapixels vs. 5 (!) on my old camera. And it's a beautiful spring day. The phone store guy moved over all my stuff from my old phone, so I still have the icons I used for businesses in my contacts list, my downloaded fics and free e-books (which I have imported into a freshly downloaded Aldiko reader), and my old cellphone wallpaper ... which looks all blurry because the screen has a much higher resolution. I need to find the wallpaper specs (it's a Galaxy S4 - the newer ones are too big for my chunky little hands) and make a new one. ETA for my own reference: 1920 x 1080 pixels for S4 wallpaper, says the Intarwebz. Oh, look, cho has been at her photographing again! Gosh, it only took me two weeks to get them processed, posted, and tagged! That's pretty good, for me! The Young Lady came home for the weekend. I told her the story about that photo. And she was all "You took that photo??? It is most recently on memebase. 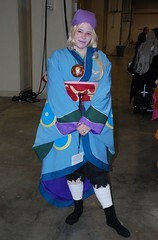 One of my Katsucon photos - the one of the girl in the dress made of Pokemon cards - was posted on a site called Geekologie. In fact, it is still on the front there. That explains why my views count has just exploded, especially on that picture ... . The con hotel has a very striking design, with a huge atrium whose westward wall is glass, overlooking the Potomac River. The Gazebo level is charming but full of photographic peril: if you shot toward the glass wall, things are full of glare and all backlit, while if you shoot with you back to that, the walls and floor are all shiny and white: good for some costumes, bad for others. The ground floor of the atrium is an indoor garden, with little streams, pavilions, bridges, and plantings, but it's usually pretty crowded. As usual, I appreciate any help people can give me in labeling the fandoms and characters. ETA: In this post, I know Grell (far left) and Yuuko (second from right). But if you have patience, take a look at the Flickr set. I didn't actually spend as much time taking photos as I might have. The gazebo level of the hotel (where I did most of it) looks like a fantastic setting for cosplay photos at first glance, but if you are shooting toward the huge glass wall that overlooks the Potomac, you get horrible backlighting and glare. And the walls and tile are almost completely white, which is good for some costiumes but very bad for others. The ground level of the hotel, with its indoor garden full of little streams, fountains, plantings, and bridges, is actually a nicer setting, but it's crowded with people during the day. As usual, I appreciate any help people can give me in labeling the fandoms and characters. It's easier to edit photos than to write when I feel cruddy. The photo set is here. If you are organizing some sort of relief drive and need some pictures of aid being delivered in Haiti, the International Federation of Red Cross and Red Crescent Societies' Flickr site has some very effective photos marked with Creative Commons tagging, so that they can be used for non-profit efforts. Look for the notation "Some rights reserved" and click on each of the icons to the left of the note to see the specifics of how to use the material legally. The U.S. Coast Guard also has a site with some effective Haiti pictures, for those who want pictures of U.S. aid efforts for this sort of use. We've done this one before, folks, but lawless523 had a spiffy Gravitation image on hers so I commented and now have to play! Besides, last time I did my office PC. This time, it's the Mac at home, but it's still a landscape photo. This is the last batch for a while - I'm all caught up, finally! 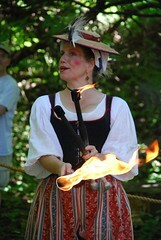 Slack rope dancer (on the ground) - with flaming torches! 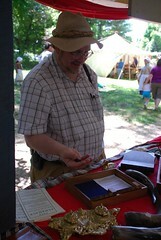 Maybe I'll take some more at the Ren Faire (which I hope we'll finally make next week). 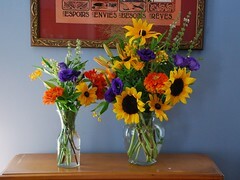 Summer Flowers from the Farmers Market! Karl brought me a bouquet too large for one vase. He also bought peaches, tomatoes, and two kinds of bread. A lot of the produce comes from Pennsyvania, and with the milder, cooler weather we've been having, hot weather produce like tomatoes have been slow to ripen. I suddenly realized that I had never posted all the photos I took at last year's July 4 parade here in Takoma Park. 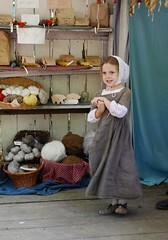 (This year, of course, we were in Cape Cod for July 4.) This woman was part of a troop of South American dancers. There are tons more photos up on my Flickr account - I meant to tell the parade committee they could use them for their site if they wanted, so I included as many of the parade units as possible. I wonder if they would still be interested. Oh, and this post is also an experiment in automatically creating an entry from Flickr. Katsucon 2009 Costume Photos Finally Posted! 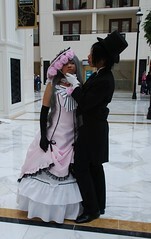 As usual, I would deeply appreciate any help in ID'ing the characters being portrayed. redbrunja, there's a huge group of Soul Eater cosplayers! And I'm insane - I should be in bed asleep. It's snowing! It shouldn't snow this early in Washington ... maybe by the end of the month, or in January or February. But not in the first week of December. Some of the trees still have leaves on them! So I think I mentioned that I had bought a digital camera. This was, like, way past due: I'd been meaning to do so for years, and I have traditionally been the member of the family who takes the pix at get-togethers. I certainly intend to make prints of the best ones and give them out to the relatives, as I always have, but it would probably be a good idea to have a place to put them online as well. I know there are free sites for these, and I know most of their names from seeing other people use them, but I might actually be willing to pay money for mine, given my traditional role in our extended family (and how much I usually get into it). Are there sites that allow you to vary the the security level by album? So I could post things I don't care about open to everyone, and pictures of the minor children of kidnapper-fearing relatives locked, so that only the people to whom I send the password could view them? Are there sites that people have used, and would like to recommend?